button in the Partners section of the Admin Panel. You can also click the Partners Login link at the bottom of your website or go directly to partners.my220.com. When going to the site directly, you will be prompted to enter your domain name before logging in. To send a new Partner their login information you can click the icon in the Partner Overview section under the Actions column. You can also click the Send Login Information button at the top of the page when editing a Partner's information. Partners will be emailed a link to login, their username, and their password. Once logged into the Partner System, you will be taken to the homepage which displays the Marketplace, as well as a navigation menu. 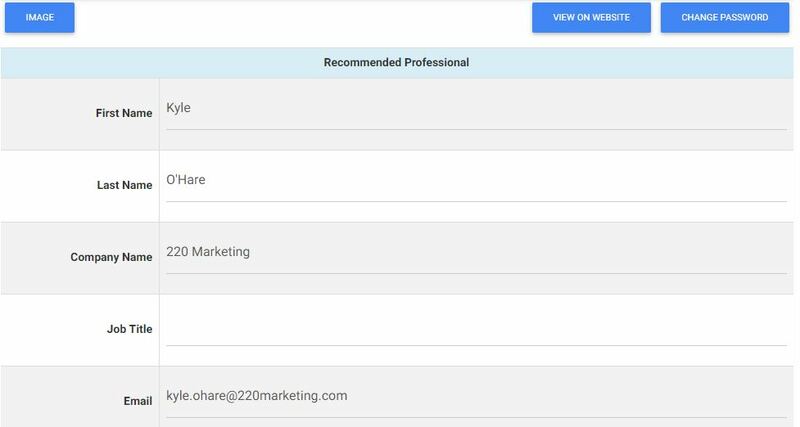 From the navigation menus, Partners can access the Marketplace and their Profile which contains their Recommended Professional and Contact details. The Marketplace will display the current listings that belong to the Partner. From here, a Partner can edit existing listings as well as create new listings. These functions will mirror those available in the Admin Panel. at the top of the Overview or Marketplace pages. Click the Edit button under the actions column to edit an existing listing. 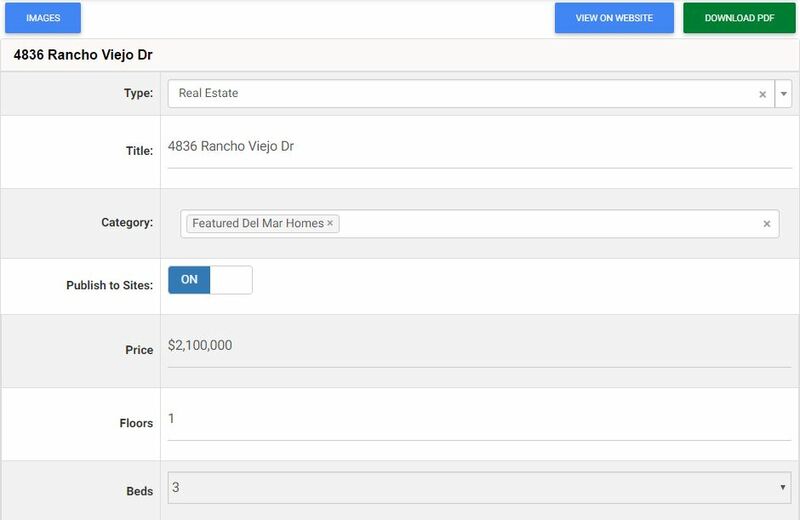 The first section when creating a new listing includes standard fields that pertain to all listing types. 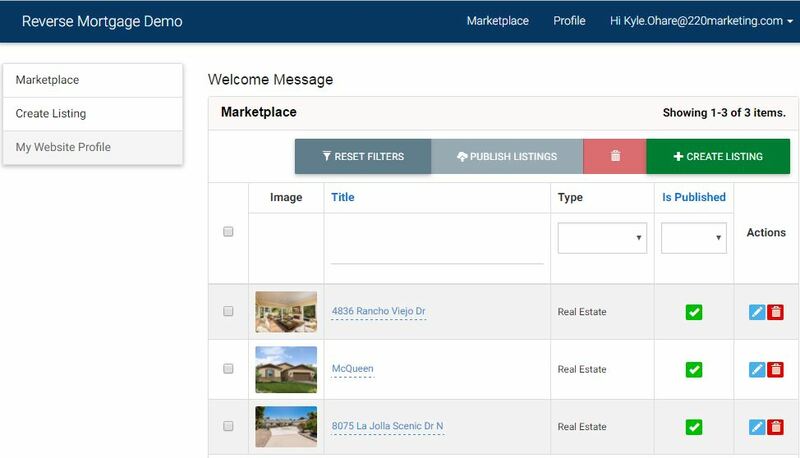 The title will be reflected on both the preview and the listing itself and will be used to identify your listing throughout the Partner System and admin panel. Each listing can be assigned to a category or multiple categories depending on how you choose to organize your listings. Listings can be created at any time but will not appear on your website until they are published. To publish a listing at the time of creation, toggle the Publish To Sites button to On. Subsequent fields will be unique to the listing type that is being created. Once a listing has been saved, the View on Website, Preview Listing, and Download PDF buttons will be available. Always remember to click Save at the bottom of the page when making changes to a listing. To access the Partner Profile page, a Partner can click Profile in the header or click My Website Profile from the menu on the left of the homepage. The Profile page allows a Partner to update their Recommended Professional and Contact information as well as change their password. The View on Website button will take the Partner to their Recommended Professional page on your website. Always remember to click Save at the bottom of the page when making changes to a Profile.